The "Wheelhouse Tablature Book" and Backing Tracks is now available in PDF & MP3 formats. 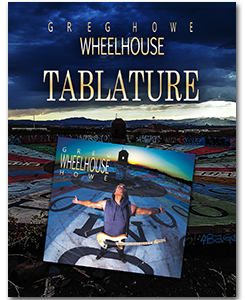 Unlike most tablature books, the fingerings and overall transcriptions are unquestionably exact, due to the fact, that Greg worked directly with the transcriber and verified every note contained within the 2017 release "Wheelhouse". A DOWNLOAD CARD WILL BE MAILED IN ORDER TO REDEEM YOUR DOWNLOAD ACCESS CODE FOR THE TABLATURE AND BACKING TRACKS!